* Professional tuition is given by a highly qualified teacher (Bachelor of Music Education with Merit - Sydney Conservatorium of Music) with over twenty five years of experience. Marion is also a member of the Music Teachers Association of NSW and the Australian String Teachers Association. * Students of all ages and experience are catered for. The studio environment is safe, friendly, and above all supportive. The aim is to encourage and develop the potential of each student. For more details about tuition or special occasion music, please click on the links in the menu above. Book now for 2018! 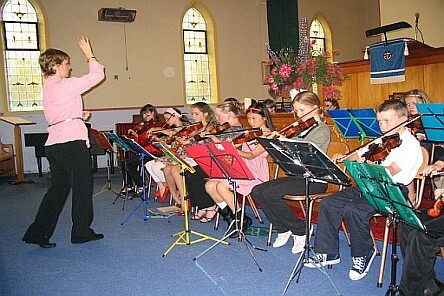 * Violin tuition is offered for all ages and from beginners to advanced. The fee is $35.00 for the standard half hour, weekly lesson. There is also the option of fifteen minute, forty five minute or one hour lessons. Some fortnightly lesson times may also be available if you cannot come weekly. * Students can prepare for AMEB violin exams or may also just learn for their own enjoyment. * A wide variety of music is offered to give students the broadest possible experience and to cater for individual taste. * Tutoring is also available in Musicianship or the AMEB's new Music Craft syllabus. * Violin students are also encouraged to join the String of Peace Orchestra Workshops which provide enjoyable opportunities for students to develop ensemble playing skills as well as interaction with other violinists. * Student workshops and performances are held throughout the year.